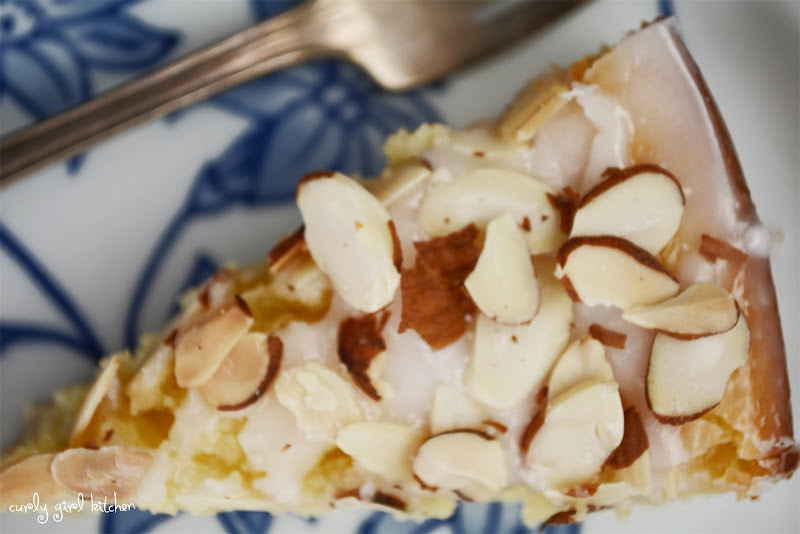 When I was little, I remember my mom making a Danish pastry called almond kringle, and I'm not sure if it was that butter-layered, almond-scented yeast dough or my own Danish heritage, but to this day, I have a weakness for almond pastry. 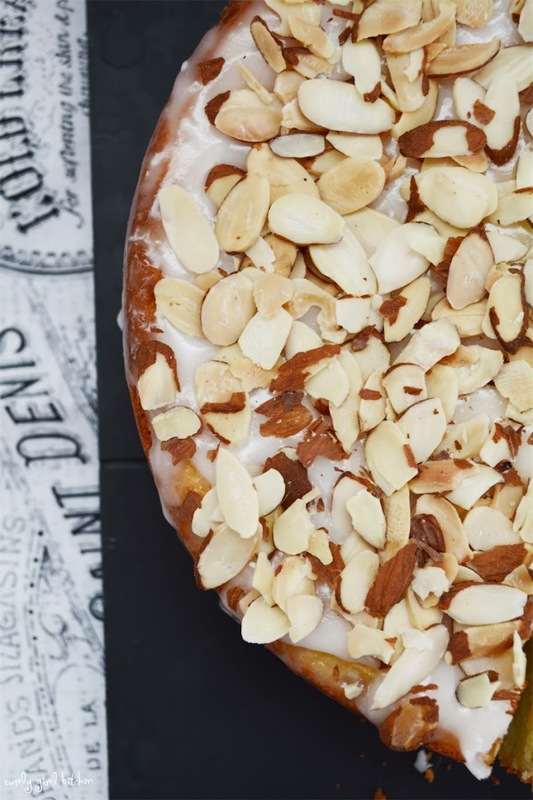 Danish kringle has an interesting history, and was introduced to Racine, Wisconsin in the late 1800s by immigrant Danish bakers, but it came to Denmark through German bakers from Austria at a time when the Danish bakers in Copenhagen went on strike. The word kringle comes from the original pretzel shape in which they baked the pastry, and is also a symbol hung outside all Danish bakeries, although the pastry is now commonly baked in a ring. 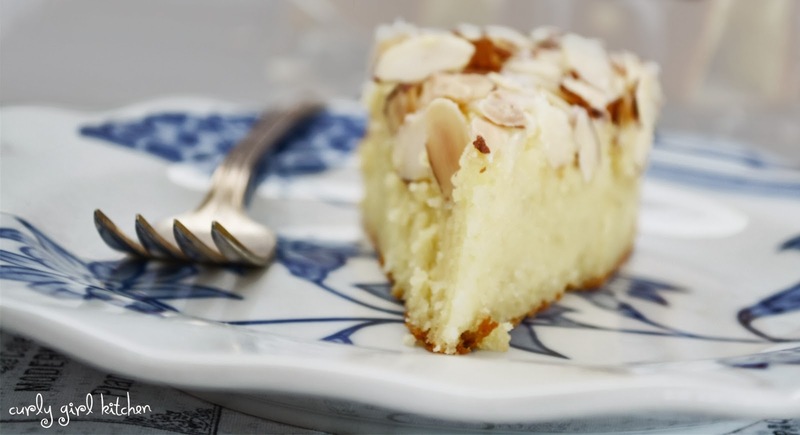 It was my memories of that delectable pastry that inspired the almond torte I've made for you today. 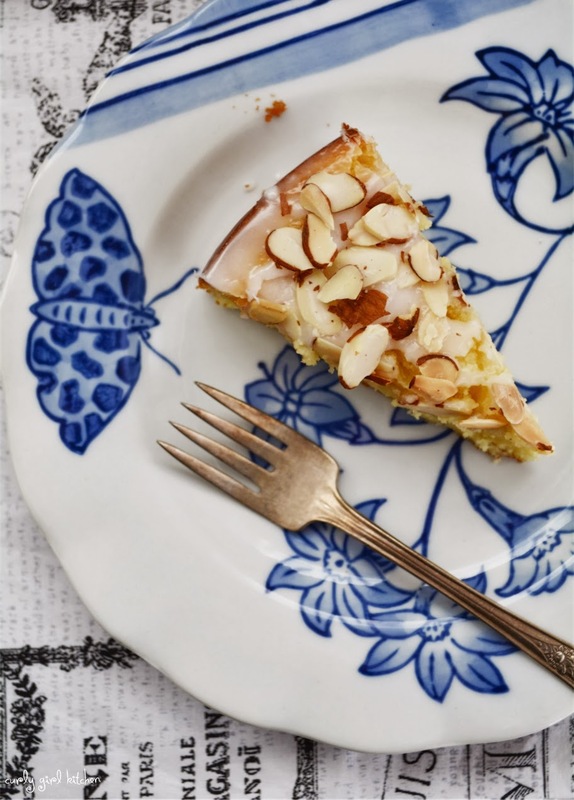 While the making of Danish kringle is incredibly labor intensive, with rolling thin layers of butter between yeast dough, this torte is as simple a pastry as I could imagine. I decided to make it flourless because I wanted to introduce the almond flavor in as many ways possible, with almond meal instead of flour in the batter, sweet almond paste as the sugar element, a hint of almond extract in the glaze, and of course, toasted sliced almonds sprinkled on top. And although gluten free baking is not something I generally practice or have much experience in, this torte just happens to be naturally gluten free. 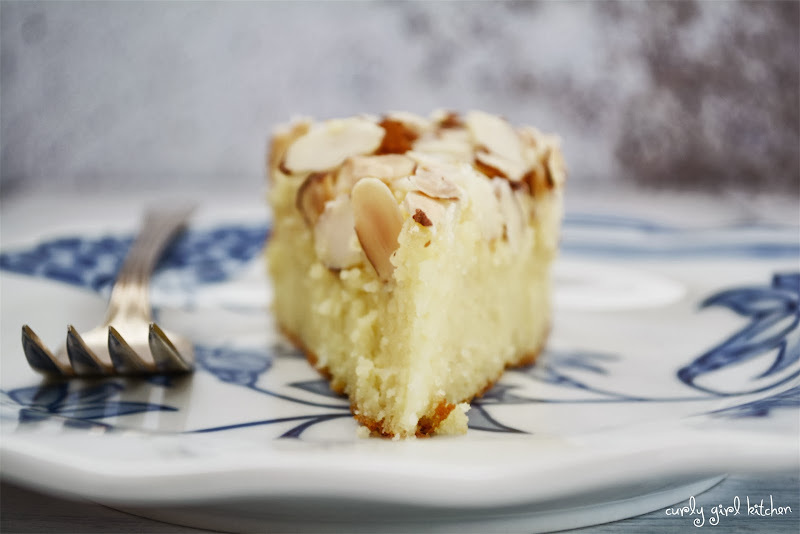 The batter is simple and elegant with just five ingredients of cream cheese, butter, almond paste, eggs and almond meal (really, six ingredients, though, if you want to count the pinch of salt). With no leavening other than eggs, it bakes beautifully and surprisingly puffy, and then as it cools, the puffy cake-like texture settles down and condenses into a rich flat torte. Since the torte itself is not very sweet, the sugary crusting glaze drizzled over the top adds a welcome sweetness, with the toasted almonds finishing it off with their warm nutty aroma. Lars Larson was on his deathbed in an upstairs bedroom. His doctor had said Lars would last for only a matter of hours. Lars woke from a deep sleep and sniffed. His wife must have just returned from the bakery, and the aroma of freshly baked kringles brought a spark to Lars. He whispered, "If I could just have a taste of kringle before I die, it would make my dying sweeter." Lars mustered every ounce of strength and got out of bed. Slowly he made his way downstairs and into the kitchen. There, he spied two kringles on the counter. Just as he was reaching out to take a piece, his wife swatted his hand away. "Stop that," she said. "We're saving these for the funeral." Baker's Note: Set out the cream cheese, butter and eggs an hour or two beforehand to let them come to room temperature. To toast the almonds, spread them onto a baking sheet and toast them in the oven for 5-10 minutes while the oven is preheating, checking them to make sure they don't burn. Preheat the oven to 325. Spray an 8 or 9-inch round spring form pan with non-stick spray and line the bottom with a circle of parchment paper. In the bowl of your stand mixer fitted with the paddle attachment, beat the cream cheese, butter, almond paste and salt for 2-3 minutes, until light and fluffy. Beat in the eggs, one at a time, beating for 1 minute after each. Stir in the almond meal until combined. Spread the batter into the pan. Bake for 40-45 minutes, until the torte is puffed and set. Place the pan on a wire rack and start making the glaze. In a small saucepan, combine the granulated sugar, corn syrup, water and almond extract. Over medium/medium-low heat, bring to a boil, swirling occasionally to dissolve the sugar. Keep the saucepan on the heat and whisk in the powdered sugar until smooth. The glaze will begin to crust as soon as you remove it from the heat. Remove the sides of the pan and pour the hot glaze over the cake, letting it drip over the edges a little. Sprinkle with the almonds. The torte can be eaten warm, after cooling for about an hour, but I think it's best cooled completely and eaten at room temperature.